Chemical reactions are often conceptualized by making and breaking one bond at a time. The idea of localized bond alterations inhibits intuitive thinking about the structure as a whole. Our research group (Dasgupta research group link to website) is focusing on creating a thematic to use collective motions existing in the molecular structure to drive selective and efficient chemistry. Efforts are being directed to precisely measure and model these motions along with developing synthetic strategies to harness it appropriately for efficient photoinduced chemistry. Vibrations driving ultrafast ET: Ultrafast photoinduced charge transfer reaction is usually the first step towards solar energy conversion. Currently supramolecular structures incorporate donor-acceptor pairs based on distance and orientation constraints. This static picture limits the performance of such structures as we often overlook the dynamic nature of these reactions due to poor mechanistic understanding of the driving reaction coordinate(s). Using steady state and time-resolved electronic and vibrational spectroscopies, we try to derive mechanistic information of photoinduced reactions occurring in homogenous solutions and also at solid-molecule interfaces. The experimental data is modeled by MD simulations which would enhance the insight into these processes. Our work aims to use the thermally accessible collective motions to drive efficient photochemistry in molecular assemblies. ET driven enzymatic reactions: Enzymes are nature’s molecular devices for carrying out selective chemistry with high turnover rates. However, little is known about how collective modes in these proteins all coherently work together to make the reaction so efficient. As a first step towards understanding these pathways, we are working towards elucidating reaction mechanism of an electron-triggered isomerization reaction of prolycopene, a large conjugated carotenoid, to lycopene which is an important step in biosynthesis of photoactive trans carotenoids. 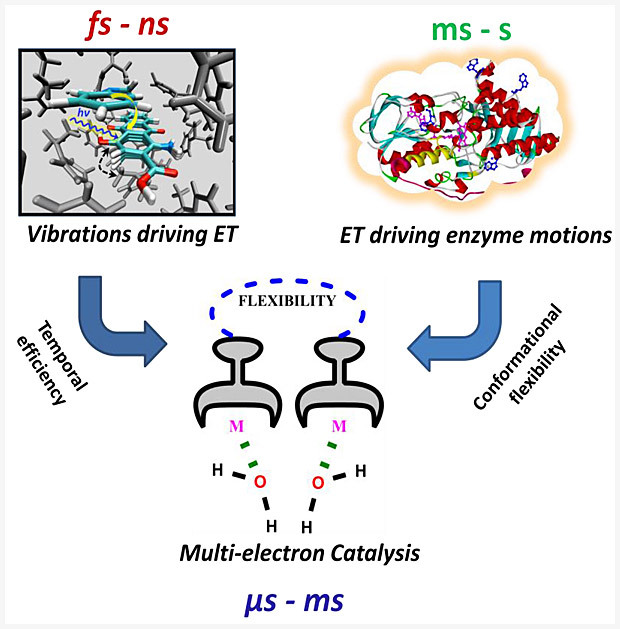 Controlling ET rates via conformational flexibility: In order to develop new photocatalysts for multi-electron oxidations or reductions, we have to control electron transfer reaction by priming them for the product release step. To achieve this, a systematic approach is needed to optimize reorganization penalty in ET steps. We are using a flexible ligand design to carry out the multi-electron redox chemistry, and addressing the question of optimized reorganization energies.